In shared office spaces the receptionist needs to know how to answer the phone for each tenant, easily transfer calls to the correct contacts, take notes, be aware of office hours, check calendar schedules, and do all this quickly. 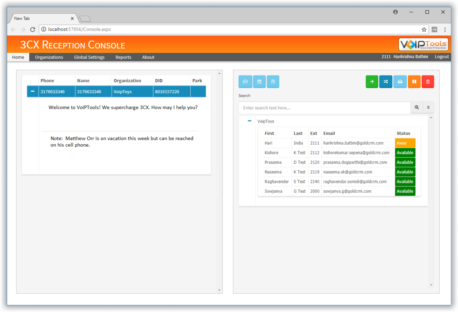 Now with our 3CX Reception Console add-on, this complex task just got a lot easier. At VoIPTools we constantly strive to provide new features that extend the capabilities of 3CX and make complex tasks easier. Our 3CX Reception Console add-on greatly increases the efficiency and ease of managing multiple simultaneous inbound calls for shared receptionists. There is nothing to install on the receptionist's PC so the receptionist can work on-site or remotely. Displays the correct organization answer script so the receptionist knows what to say when answering calls. In addition to the standard answer scripts, any priority notes are also displayed for the active call. It's important to know whether the contact is available. 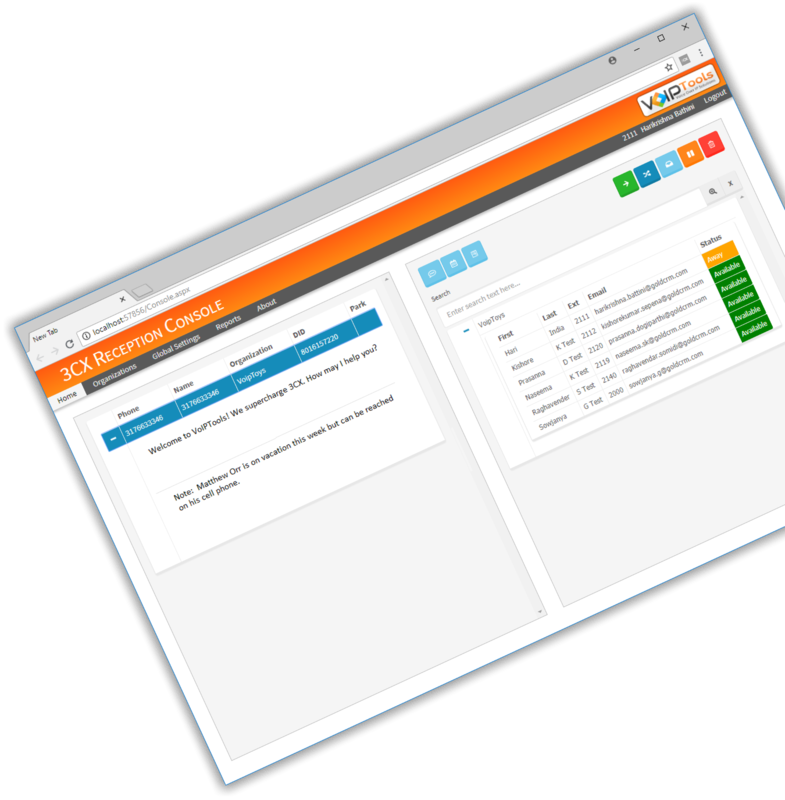 Displays the contacts current presence status in 3CX. Having the information at your fingertips means you can provide better service, with greater accuracy, without getting frazzled. Need to bill back for your receptionist's time? Now you can track how much of the receptionist's time is used by each tenant. In the left-hand pane view all inbound calls. Based on the number the caller dialed, the console displays the organization the caller is trying to reach as well as the “answer script” which tells the receptionist how to answer the call and any priority notes. When an active call is selected from the list on the left, all the contacts associated with the organization will display in the right-hand pane. It also shows the current status of the contact (Available, Away, etc.). To manage a call, the call is selected in the left pane, then a contact in the right pane, then an action button is selected (transfer, attended transfer, voicemail, park, drop, etc.). You can also email notes to the contact as well. While our tools will function perfectly when installed directly on the 3CX server, it is strongly recommended you install our tools on a separate server.